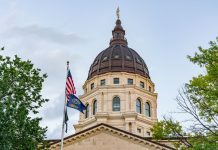 Kansas has the eighth highest state and local average sales tax rate, according to a new study from the Tax Foundation. It revealed that Kansans pay an average of 8.67 percent in sales taxes on retail purchases within the state. The states of Delaware, Montana, New Hampshire, and Oregon do not have sales taxes. Among states with a sales tax, consumers in Alaska paid the lowest average state and local tax rate of 1.43 percent. Hawaii, Wyoming, Wisconsin and Maine rounded out the lowest average rates. Purchases in Maine pay an average of 5.50 percent in sales tax. Graphic courtesy of the Tax Foundation. 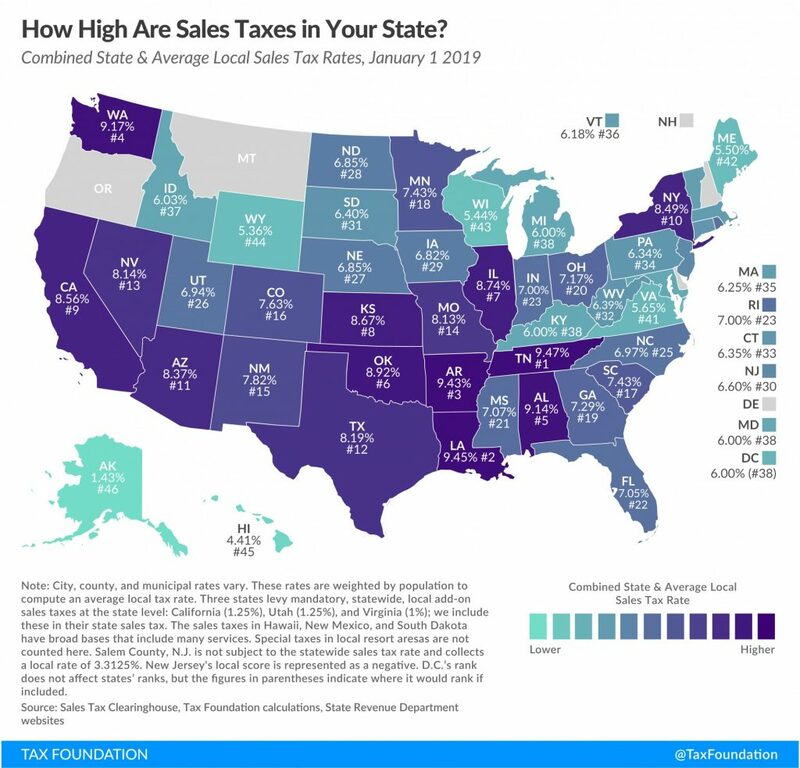 The states with the highest average combined state and local sales tax rates are Tennessee at 9.47 percent, Louisiana at 9.45 percent, Arkansas at 9.43 percent, Washington at 9.17 percent and Alabama at 9.14 percent. Washington doesn’t tax income. Tennessee also doesn’t tax income, though the state does tax interest and dividend earnings. Dave Trabert, president of the Kansas Policy Institute, says Kansas rates are high because government spends so much. “The only thing that determines who much you tax is how much you choose to spend,” he said. Trabert says data from the National Association of State Budget Officers shows the states that tax income spent 50 percent more per-resident in 2016 than the states without an income tax; Kansas spent 36 percent more per-resident that year. And consumers can simply cross state lines in order to realize sales tax savings. Kansas’s neighboring states have lower average sales tax rates. Nebraska purchases net an average of 6.85 percent in sales taxes, good enough for 27th. In Missouri(14th), the average retail sales tax rate is 8.13 percent; it’s 7.63 percent in Colorado (16th); and 8.92 percent in Oklahoma, the only neighboring state with a higher average state and local sales tax rate than Kansas. 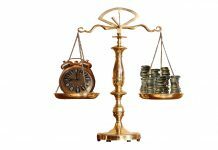 When consumers make large purchases, they are likely to avoid higher sales tax jurisdictions, according to the Tax Foundation. “For example, evidence suggests that Chicago-area consumers make major purchases in surrounding suburbs or online to avoid Chicago’s 10.25 percent sales tax rate,” the study reads. And businesses often locate outside the borders of higher sales tax areas. The Tax Foundation says New England is a prime example. Along Interstate 91, which bisects Vermont and New Hampshire, more retail establishments locate on the New Hampshire side of the border. 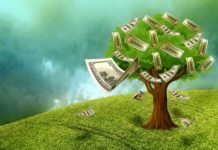 “One study shows that per capita sales in border counties in sales-tax free New Hampshire have tripled since the late 1950s, while per capita sales in border counties in Vermont have remained stagnant,” the Tax Foundation survey reads. Her 2019 budget proposal doesn’t include lowering the state sales tax rate on food, however. Instead, her proposal increases state spending. Trabert says every state provides the same basic services. “But some states provide them with better prices and that means they can have lower taxes,” he said.